Merit Abrasotex PowerStrip discs are suitable for removing coatings on metal, wood, and plastics, and in difficult to reach areas due to the conformable design. This disc features a resin bond. Resin bonds have good moisture resistance, are harder and less flexible than glue bonds, and have good heat resistance and grain retention. Resin bonds are useful for abrasive operations with high operating speeds, impact, and sudden loading, as the resin bond is strong and waterproof. Nylon fiber does not rust and is waterproof. This disc is suitable for use with a die grinder. Use with molded-rubber backing pads. Use a hard pad for aggressive cutting, a medium pad for general-purpose applications, or a soft pad for contours and fine finishing work. Silicon carbide is a sharp, aggressive grain that offers high penetration, fast cutting, and high material removal even under light pressure. It is commonly used with softer materials like brass, plastics, and rubber, and abrasive materials like glass and enamel, but can wear out faster than aluminum oxide when used on wood. Nonwoven abrasives have individual abrasive grains interspersed throughout an open web of nylon fibers. Open web construction produces a cushioned, three-dimensional material that is pliable, long-lasting, and will not rust. The uniform dispersion of abrasive throughout the web provides a supply of new grain as the old grain and fibers wear away during use. The nylon web is waterproof and washable. 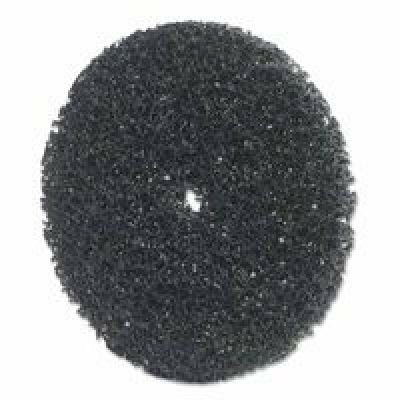 In nonwoven abrasives, the grit is designated with a letter code, from Extra Coarse (XC) to Microfine (MF).